Walker (in an article appearing in Fraser's Magazine and dated Nov. 1840, reproduced by Mark Weeks, and excerpts by Sarah) says that Boncourt and de Saint-Amant are 'engaged in a match of long standing' and 'have played in all about thirty-five games; and Boncourt stands at present, I believe with a majority of three.' Diggle (in the British Chess Magazine in 1933, which article is quoted by Winter) quotes Delannoy to say that Boncourt was leading at first, but admitted de Saint-Amant's superiority at the end. Spinrad's results list and La Grande Storia degli Scacchi give the result under the year 1840. Spinrad's article on Deschapelles says 'around 1840'. However, the first issue of Le Palamède in 1839 describes Walker's visit to Paris as taking place over that winter (of 1838-1839). So even though his article appeared in late 1840 in Fraser's Magazine, he was probably describing his visit of almost 2 years earlier. In fact, Boncourt's death is announced in the third number of Le Palamède of 1839 (of only four numbers, so what month is not clear), so the end of this series of games may not have been in 1840, though these last issues of Le Palamède were well behind schedule. 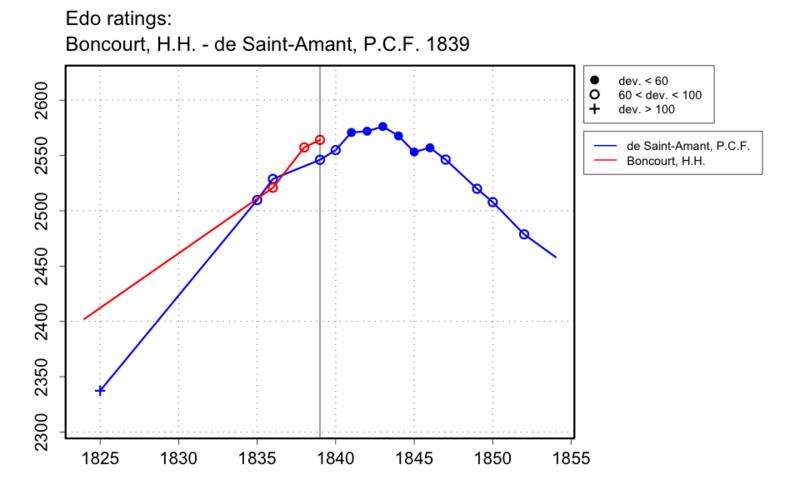 In the Feb. 1838 issue of Le Palamède (v.2, p.521), a game is given between Boncourt and de Saint-Amant, played several years earlier, part of a match of 25 games, in which Boncourt came out ahead. However, Walker in Bell's Life in London (18 Jan. 1835) says that they recently played a match of 25 games which de Saint-Amant won with difficulty. Were there two such matches of 25 games? Since Walker's later account of 35 games seemed to include all they had played, I suppose it included this 25 game match as well. The query from W.G. Povarov in Winter's book suggests that this series of games started in 1837, but unless the 25 games mentioned in the Feb. 1838 issue of Le Palamède (and the 18 Jan. 1835 issue of Bell's Life?) were a separate result, the indication is that it started several years earlier. The Illustrated London News of 28 Dec. 1844 (p.416) says the match took place in 1837. I will take the start date to be 1834 and the end date to be 1839.